(Seattle, Washington) – Seattle is home to numerous firms in the life sciences arena. The buildings that house them are often described as mixed use with office, laboratory, and research space. 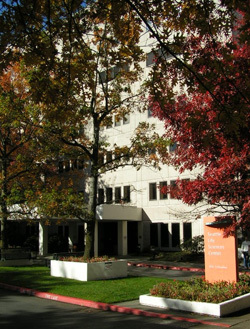 Unlike many such facilities throughout the metropolitan area, however, the Seattle Life Sciences Building at 1124 Columbia Street is located in the heart of the city. 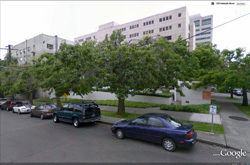 It’s within a short distance of major medical centers, Seattle University, and many other downtown attractions. Built in 1976, this 7-story facility (192,290 sq. ft.) is home to medical practitioners as well as research and biotech firms with names like Cellnetix Pathology, Theraclone Sciences, the Infectious Disease Research Institute, Dharma Therapeutics, the Fred Hutchison Cancer Research Center, and more. The facility is owned by Alexandria Real Estate Equities (ARE), the international leader of, and largest owner of, real estate in the life sciences industry. The building’s mechanical systems have been served by a proprietary control system for many years. In more recent years, ARE representatives have desired a more open approach. 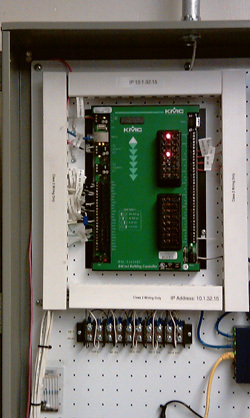 As a result, a BACnet automation system from Alerton has been in place for a portion of the building. Still more recently, however, building needs have grown beyond that for which the automation system was intended. That’s when the challenge fell to Steve Depew and Roger Norman. Steve is a consulting/design engineer with Engineered Building Controls of Burien, Washington and Roger is owner of Northwest Automation of Tonasket, Washington. Roger’s company, a building automation and energy management system contractor, is also an authorized representative of another BACnet manufacturer, KMC Controls. The challenge? Create a heat recovery system using heat reclaimed from exhaust fans and waste steam condensate. The Life Sciences Building uses the steam for several processes including AHU heating, CAV and VAV reheat, humidification, and autoclaves (for sterilizing medical equipment and supplies). Once used, however, the condensate from the steam’s use was collected and dumped down the drain. Further, the hot condensate was tempered by domestic water to protect the city sewage system from being overheated and to protect the glass drains throughout the building from breaking. This was certainly not a sustainable approach favored by ARE, its tenants, nor the City of Seattle in general. Steve, Roger, and their respective teams designed and installed a system that captures all of the hot condensate throughout the building. This hot condensate is then pumped to storage tanks in the mechanical room. In addition to the reclaimed heat from exhaust fans, a plate-and-frame heat exchanger is also used to extract heat from the stored condensate. In turn, the condensate is put down the drain at acceptable temperatures. Captured, heated water is used to preheat the 100% outside air at the AHU intake, thus dramatically reducing the need for steam heat. During warmer weather, the heated loop water is diverted to exhaust fan coils for heat rejection to the outside air. Not satisfied with only addressing energy efficiency and heat recovery, Steve also saw an opportunity to protect the existing steam coils from freezing and used the heat recovery system to provide freeze protection. This meant no more cracked steam coil headers flooding the lower floors and no more 3:00 a.m. AHU freeze protection shutdowns requiring emergency calls to the facility engineers! Of course, such a creative approach requires precise control. 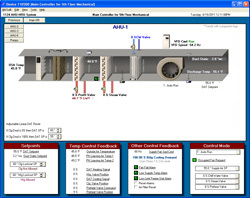 The entire heat recovery system and 4 Air Handling Units (previously under proprietary control) are controlled by the BAC-A1616BC BACnet Building Controller (B-BC) from KMC Controls. Its capabilities are further extended through the use of 4 KMC B-BC expansion modules. 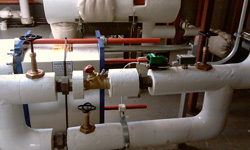 Various KMC valves and sensors complete the control sub-system functionality. The powerful KMC building controller serves up its own web pages. These pages are integrated nicely into the operator workstation of the existing Alerton BACtalk control system. Thus, the newer control functions become a seamless part of the overall building automation scheme.